The Princess Has Been Kidnapped Again! The gameplay in New Super Mario Bros. U is similar to other games in the New Super Mario Bros. series, but as always there are plenty of new features as well! The first new feature is the flagship power-up of the game, which is the Squirrel Suit that allows you to glide, cling to walls, and even float upwards during a glide to save yourself from a pit or lava! 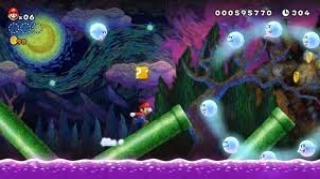 Another great feature is the return of the baby yoshi who can help you in various ways such as illuminating a dark level or trapping enemies in bubbles! 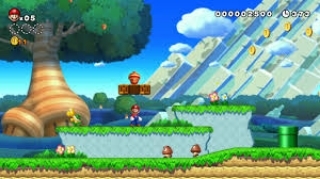 A unique change is that you start outside of the Mushroom Kingdom and must work your way the Peach's Castle which is where you normally start your adventure! There are secrets to unlock via Star Coins, but some can be extremely difficult to find or reach meaning it'll likely take awhile to obtain them all. The level designs are amazing and are littered with secrets and some levels require finding hidden exits to reach. The game is rather easy though as 1-up's are far too easy to obtain, but this is only a minor complaint. The coin battle multiplayer modes have returned and are quite enjoyable. You can even use a Mii during the coin battle mode! A new feature is the challenge mode in which you can test your skills by completing certain levels in a set amount of time to earn bronze, silver, or gold trophies! The controls in the game are very simple and easy to learn, but the Wii Remote sideways feels the most nostalgic while playing the game. The platform boost allows another player to use the gamepad to create platforms to aid you during the game and is a neat feature. Overall the controls are flawless in the game! 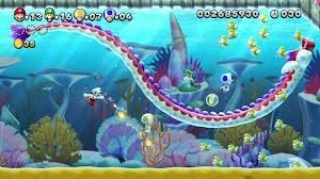 The graphics in New Super Mario Bros. U are crisp and vibrant and truly showcase how nice 2D games can look in HD! The enemies and backgrounds look utterly amazing and detailed. The music on the other-hand is mostly recycled from earlier games in the series which isn't necessarily a bad thing, but a few new tracks would have been nice. Overall the graphics are gorgeous and the music is good albeit unoriginal. With superb gameplay, flawless controls, and gorgeous graphics this game is perfect for any gamer and the few complaints we had were very minor so if you own a Wii U we highly recommend that you purchase this amazing title! This is on my must-play list! Brilliant review. This was my first game for the Wii U and I still play the game with my mum sometimes. I still haven't beaten Star Road in this game. The New series is overused, but even so they are very good games. I agree with the score this game rules! Good review. I think that the series is more unique than most people give it credit for. The New super mario bros. series will be "new" forever. 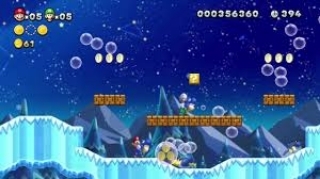 @SuperVash wrote: The New super mario bros. series will be "new" forever. Maybe after Final Fantasy XV and Kingdom Hearts 3 we'll see New Final Fantasy and New Kingdom Hearts as new seems to be a common prefix for video game titles lately lol. Believe it or not, the originally-planned title for The Legend of Zelda: A Link Between Worlds was "The New Legend of Zelda", because it was like a Zelda version of New Super Mario Bros. (classic gameplay with a modern twist and upgraded visuals); they decided to change it because they thought that series purists would dislike the name change!